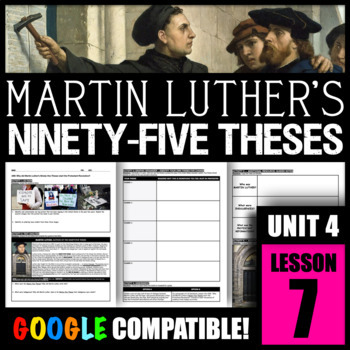 Why did Martin Luther’s Ninety-five Theses start the Protestant Revolution? 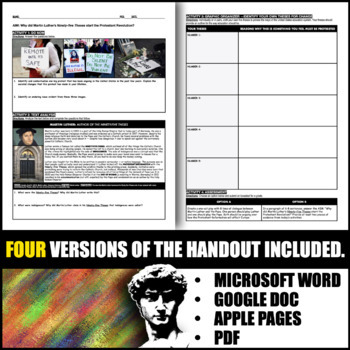 ACTIVITY 1 -- DO NOW: Students will identify protests that have been ongoing in the United States within the past few years. Students will discuss why they happened and how their message was spread. 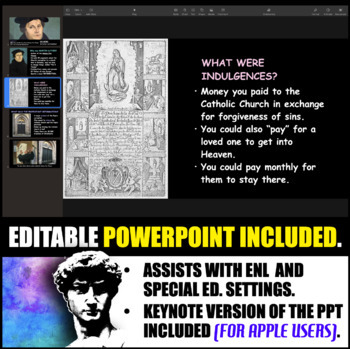 ACTIVITY 2 -- TEXT ANALYSIS: Students will define the Ninety-five Theses, indulgences, and the Protestant Reformation after reading three paragraphs with the historical context of Martin Luther and the Reformation. ACTIVITY 3 -- -YOUR- FIVE THESES: Students must work in pairs to create five theses regarding the American education system. With each thesis, students must explain why this is something they feel needs to be changed. As a class, discuss the ways the message of these theses could be spread. ACTIVITY 4 -- ASSESSMENT: Students will choose an option to complete on looseleaf for assessment. ASSESSMENT: Students may complete the assessment, or answer the AIM using the R.A.C.E.S. format (FREE Download Here).